If you’ve ever had stuffed mushrooms appetizers a party or dinner, then you know how delicious those succulent little devils are! So, after seeing a few versions pop up on the Internet lately, I decided to make my own, low-calorie Stuffed Mushrooms Casserole that would fulfill all the taste requirements of traditional stuffed mushrooms, but still be a good Weight Watchers Recipe. I added some savory seasonings like thyme and sage, which remind me of Thanksgiving stuffing. And I used Panko breadcrumbs to keep it light, but still bread-y (yes, that is a word, ok?) It was absolutely delicious! Covered in ooey, gooey mozzarella cheese, and very satisfying, this guilt-free Weight Watchers casserole recipe was a real hit. It goes perfectly with your favorite chicken or turkey entree and heats up very nicely as leftovers the next day. This Stuffed Mushroom Casserole Recipe an absolute winner. Shake things up with the delicious and unique low calorie casserole recipe that puts stuffed mushrooms into a new form. Savory and satisfying, it makes an excellent Weight Watchers side recipe for your favorite main course. Preheat oven to 400 degrees and spray a 2qt casserole dish with an olive oil mister or non-fat cooking spray. In a medium, nonstick skillet melt butter over medium high heat. Add in onions and celery, and cook until tender, about 5-7 minutes. Add in mushrooms, garlic, thyme, sage and salt and pepper, and cook until mushrooms are soft, about 5-7 minutes. Transfer mushroom mixture to a large bowl, and stir in all remaining ingredients, except for the shredded mozzarella. 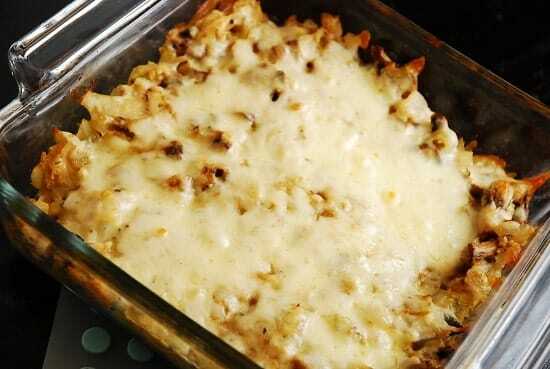 Pour into prepared casserole dish and top evenly with the shredded mozzarella. How do I add crab? How would one go about adding fresh crab to this recipe? I’m challenged to bring a crab dish and this recipe sounds so good….What do you think? Going to make tonight, sounds yummy! I tried this tonight and it was delish! I’m wondering if you can freeze it for leftovers? Made this to go with grilled pork tenderloin tonight. Delicious! I put all the ingriedients into the weight watchers calculator online and for 6 servings, I’m coming up with 5 points?? RE: Points Plus values: WW Recipe Builder will add points for cooked vegetables as a part of a larger recipe, which is probably why you’re getting a higher count. Made this tonight and it is absolutely SCRUMPTIOUS!!!!! WINNER, WINNER! Thanks so much for sharing your awesome recipes with us!